FATIMA FARHEEN MIRZA was born in 1991 and raised in California. She is a graduate of the Iowa Writers' Workshop and a recipient of the Michener-Copernicus Fellowship. “Absolutely gorgeous...Mirza writes about family life with the wisdom, insight and patience you would expect from a mature novelist adding a final masterpiece to her canon, but this is, fortunately, just the start of an extraordinary career…. Has a household ever been cradled in such tender attention as this novel provides?... As Marilynne Robinson has done with Protestants and Alice McDermott has done with Catholics, Mirza finds in the intensity of a faithful Muslim family a universal language of love and anguish that speaks to us all... In prose of quiet beauty and measured restraint, Mirza traces those twined strands of yearning and sorrow that faith involves. She writes with a mercy that encompasses all things.... Each time I stole away into this novel, it felt like a privilege to dwell among these people, to fall back under the gentle light of Mirza’s words." "[An] impassioned debut novel… Mirza is attuned to the subtle ways in which siblings and parents compete for one another's affection. A ruminative final section, in which the father addresses his wayward son, is a moving coda." "The book dives into the lives of a Muslim-American family, opening on the eve of the eldest daughter's marriage, and examines the intricacies of a family straddling two very different cultures." "A stunner, worthy of a place among the finest books ever written about an American family." "If you crave a family epic, read A Place for Us by Fatima Farheen Mirza....In this stunning, gorgeous novel, Mirza looks at the crucial events in an Indian-American Muslim family from many perspectives." "A brilliant debut from Fatima Farheen Mirza... this is a story about hope, and about the ways in which, if we open ourselves up to forgive the flaws in those we love, we can better move forward toward a brighter future." "This affecting debut follows an Indian-American Muslim family as they assimilate into U.S. culture... Mirza’s expansive novel tackles everything from 9-11 to addiction, each moment offering a sliver of explanation as to how a family can become so fractured. Mirza writes about her characters with an incredible amount of tenderness, keeping readers invested." "A Place for Us resonates at the crossroads of culture, character, storytelling and poignancy." "A hauntingly beautiful and poignant story of identity, belonging and perception. This first novel from Sarah Jessica Parker's new imprint, SJP for Hogarth, is as timely as it is stunning, and is the perfect launch for an imprint designed to celebrate literary fiction titles that will resonate with all readers, regardless of race, gender or experience." "A California-based Indian Muslim family celebrates the wedding of daughter Hadia, marrying for love. Present is her estranged brother Amar, who hasn't easily mnaged the rough road between youth and adulthood, Old World tradition and America, and the novel effectively unfolds family tensions and Amar's swirling personal anguish." — KAREN RUSSELL, author of Swamplandia! 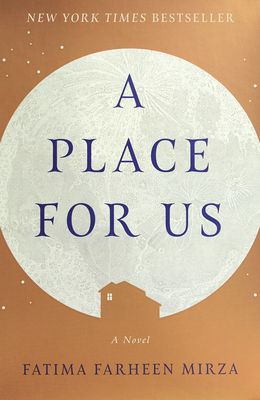 “A Place for Us is a radiantly envisioned, beautifully achieved epic about nearly everything that matters: love, family, faith, freedom, betrayal, contrition, absolution. Fatima Farheen Mirza is a magnificent new voice." "The depth of the storytelling and the beauty of the language makes this debut novel by Fatima Farheen Mirza something to treasure. Highly recommended!" "Beautiful, intimate, tender. So vividly told the characters live and breathe."